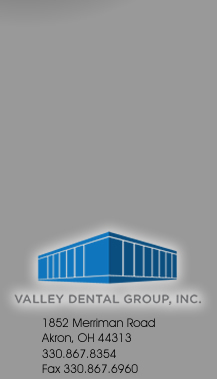 At your first appointment with Valley Dental Group, you'll discover a relaxing and non-intimidating environment. Whether you need a routine check up and cleaning, fillings, or cosmetic dentistry, we will do our best to answer all your questions and satisfy your needs to get you on track to maintaining your beautiful smile. We can perform teeth whitening, implants, root canals, fillings, crowns, bridges or can fit you with a night guard or snoring applicance. Please review our procedures page for a comprehensive listing of services we provide. We will be glad to collect all of your insurance information and electronically submit it for you. In addition to cash and checks, we accept most major credit cards, and also we participate with Care CreditTM which allows you to make no interest payments for up to 12 months. In order to help limit your wait time, please download, complete, and bring the new patient forms with you to your initial appointment.